Your position on the bike is critical. If you haven’t had a professional bike set-up, I recommend having one done before embarking on any training regime. The correct saddle height and position can make all the difference to your climbing. Far too often, I see riders approach a climb with speed, trying to sustain that speed through the climb. In this scenario, it’s when and not if the lights go out – leading to a shift down of three or four gears, high heart-rate that never recovers and a huge loss of power. Always try to start the climb as slow as you can and in a gear easier than what normally feels comfortable. As the climb goes on, gradually lift your effort and speed, maintaining the same cadence but in a slightly harder gear. Finish your climb with speed and try to carry that speed over the top. I like to consciously focus on my breathing when climbing and believe this is one of the most important techniques to remember. Be sure to remain in control of your breathing and try to find a rhythm. If your breathing becomes erratic or you don’t feel you have control, reduce your effort slightly to get it back in check. I hear a lot of riders preparing for Peaks Challenge head out on their training rides looking to climb as many vertical metres as possible. Sure this is important, but not it’s not the most important aspect to your training. For me, I like to head out for sustained rides, always on the pedals, never freewheeling. I find rolling hills are the perfect backdrop for this. There can be a lot of recovery time between hills, so the more you can reduce that, the more you are getting out of your limited training time. As you get closer to the event, aim to replicate the ride as best you can (200km+ training ride with over 3500m climbing). This provides you with information to take away and, more importantly, significantly lifts your confidence levels. Start the ride very easy and finish it with gusto! High cadence seems to be the big buzz-word. I see everyone spinning away, which is, no doubt, far better than grinding a big gear for 230kms. That said, there’s little use in spinning away like mad when you aren’t generating any power. To build up your power you need to slow your cadence down on certain training rides (to around 75). If you have a power meter, great – get the right balance between your power, cadence and speed. Ultimately you want to be running a high cadence and generating as much power as possible. Use a lot less energy and therefore ride longer with more power by totally relaxing your upper body. Your arms, chest, neck, shoulders and back should all be completely relaxed. A lot of riders struggle with riding out of the saddle effectively, quite often tiring very quickly. 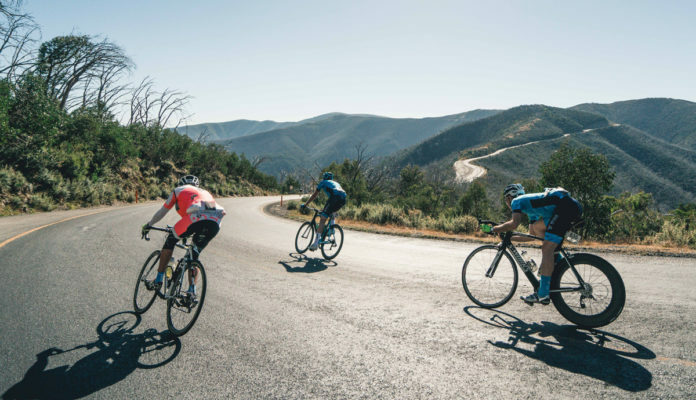 Many new riders will try to accelerate when getting out of the saddle and click into a couple of harder gears – a recipe for disaster in endurance events. Pros climb at least 30% of the time out of the saddle, adopting a technique that sees them relax when out – not accelerating, and rocking the bike not the body. 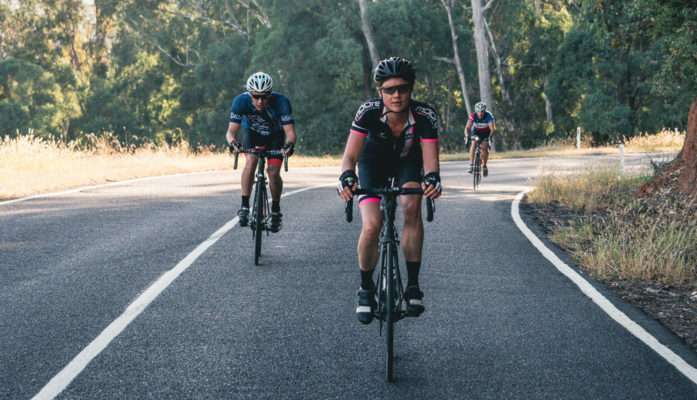 Get out of the saddle when you feel your leg speed is a bit slow in the saddle and you will most certainly maintain good momentum on the longer climbs. When I’m climbing I think about everything I’m doing – my cadence, my breathing, etc – and not about how hard the climb is, or what other riders are doing. Self focus is everything and the only way to maintain complete control and remain as efficient as possible. Ultimately your performance at Peaks Challenge Falls Creek comes down to how much time you can spend preparing for the event. We all have other priorities in life, including work, family and friends, so fit your training around them and not the other way around. It’s a one-day event and with months of planning and preparation, things can go wrong. Set yourself some mini-goals along the way, perhaps an event in December, January and February. For me, the journey to the Peaks Challenge Falls Creek is just as rewarding the the destination itself. Steve is an ex professional cyclist and owner of a pro cycling team (Savings & Loans). He also provides personalised technique coaching based out of Adelaide (www.procyclingskills.com). Our Peaks Challenge Falls Creek specific training programs are created by Dr. Stephen Lane from HPTek and 8 hour wave leader for Team Bicycle Network. 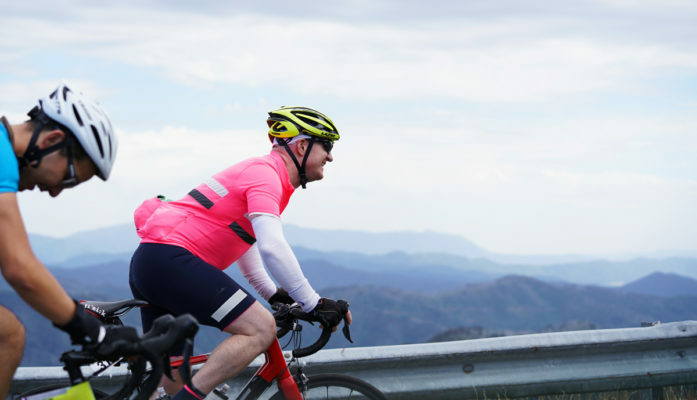 A Peaks Challenge ride is gruelling – you need to keep yourself fuelled to tackle the climbs and power through the kilometres.